I recently acquired a strand of translucent cranberry red ovals, with blue/white twisted cane decoration. I first thought they were old Venetian, since the red color is "right" However, the twisted cane is not melted into the surface smoothly as I've seen in other similar beads (the top beads in the picture). It sticks out from the surface a few tenths of a mm, making the beads very rough feeling. 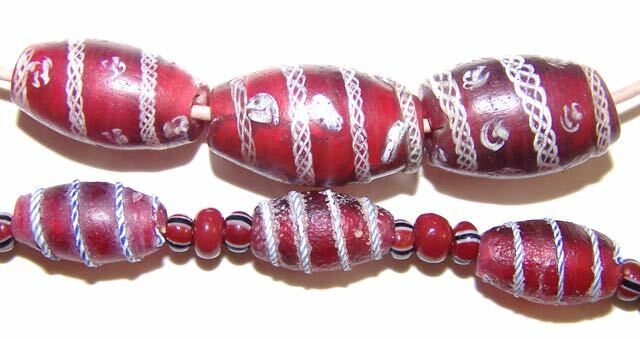 The cranberry glass is pretty distressed on most of the beads. The beads in question are about 15 mm long, with clean holes of about 2 mm. Thought I'd post this for comment while I start searching the bead cards for a similar Venetian bead.